LONDON--(BUSINESS WIRE)--According to the latest market study released by Technavio, the global collaborative robots market is expected to grow at a CAGR of more than 60% during the forecast period. This research report titled ‘Global Collaborative Robots Market 2017-2021’ provides an in-depth analysis of the market in terms of revenue and emerging market trends. This market research report also includes up to date analysis and forecasts for various market segments and all geographical regions. The market size of collaborative robots is expected to reach USD 2,101.3 million by 2021, with APAC responsible for generating the highest revenue and maximum incremental growth through the forecast period. The increased incorporation of collaborative robots by small and medium-sized enterprises (SMEs) will be a major driver of the market through the forecast period. With rising labor costs, collaborative robots come across as a very attractive alternative for SMEs to stay competitive in the market. Offerings like Racer 3 from Comau, targeted especially for SMEs will lead to the wide-scale adoption of these collaborative robots. Collaborate robots represent a balance of flexibility and technical skill, which facilitates material handling and takes complete advantage of human expertise and skills. Material handling collaborative robots can perform a wide range of operations such as machine feeding, loading and unloading, packing, palletizing, and disengaging to name a few. They are witnessing swift market penetration, especially from the automotive industry. The maximum demand for these robots is expected to be from countries like China, the US, Germany, Japan, and South Korea where there are many prominent manufacturing industries. “General assembly is forecast to be the fastest growing application segment of the collaborative robots market, with a CAGR of 62%. Industrial robots, especially collaborative robots are being employed on a wide scale to carry out complex and repetitive tasks involving heavy machinery,” says Bharath Kanniappan, one of the lead analysts at Technavio for robotics research. Collaborative robotic arms are used in industries for assembly, lifting, and positioning operations. They can also perform minute and precision jobs in internal assembly and other segments. Through the forecast period, the automotive, electrical and electronics, and semiconductor industries in China, Japan, South Korea, the US, and Germany are expected to generate the highest demand for collaborative robots. “Painting robots contain explosion proof arms for spraying coatings of paint, which may have combustible chemicals and gases, in a safe and even manner. Spray parameters such as fluid flow, voltage, atomization air, and fan air can be set for an optimal paint job,” says Bharath. Companies like SRG Global have more than 50 collaborative painting robots specializing in painting exterior automotive components of various shapes and sizes. Industries usually employ dipping for painting small parts, and large parts are painted under human guidance. Collaborative robots for painting applications are mainly being employed in metal processing, electrical and electronics, and semiconductors industries. Become a Technavio Insights member and access all three of these reports for a fraction of their original cost. As a Technavio Insights member, you will have immediate access to new reports as they’re published in addition to all 6,000+ existing reports covering segments like automation. This subscription nets you thousands in savings, while staying connected to Technavio’s constant transforming research library, helping you make informed business decisions more efficiently. 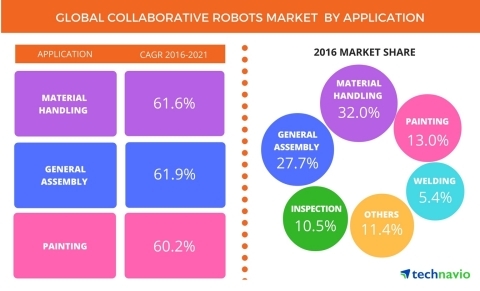 According to the latest market study released by Technavio, the global collaborative robots market is expected to grow at a CAGR of more than 60% during the forecast period.